Offres de dernière minute! -Pas besoin d'une voiture! Marchez vers tout! Pas besoin de voiture! 3 min à pied de la télécabine et du centre-ville! Il s’agit d’un grand condo de 2 chambres et 2 salles de bain; 1100 pieds carrés! Longbranch Condos ont certainement quelque chose pour tout le monde. Situé à un pâté de maisons du côté est de la rue principale. C'est une courte promenade (3 à 5 minutes) de la nouvelle télécabine conduisant les skieurs et les coureurs au sommet du pic 8 et à une courte promenade du centre de Main Street Breckenridge. Le rez-de-chaussée du bâtiment abrite un joli pavillon avec piscine, bain à remous et sauna. Une place de stationnement désignée dans le garage souterrain est incluse. Ne vous inquiétez pas pour porter tous vos bagages dans les escaliers, l'immeuble dispose également d'un ascenseur pour faciliter votre travail. Cette unité est un condo de 2 chambres à coucher et 2 salles de bain pouvant accueillir 8 personnes confortablement. Hébergement de nuit; Lit King dans la chambre principale et lit King dans la deuxième chambre et 2 canapés-lits dans le salon, tous deux pleins. Nous avons également mis des lits de taille simple à l'italienne dans les placards des deux chambres, ce qui est bien pour les enfants! Les autres caractéristiques comprennent une cuisine entièrement équipée, un accès Internet sans fil, un foyer au gaz et une buanderie dans les espaces communs. Les locations ne sont confirmées que lorsque le paiement est reçu et est le premier arrivé, premier servi. We booked at the last minute so options were fairly minimal. 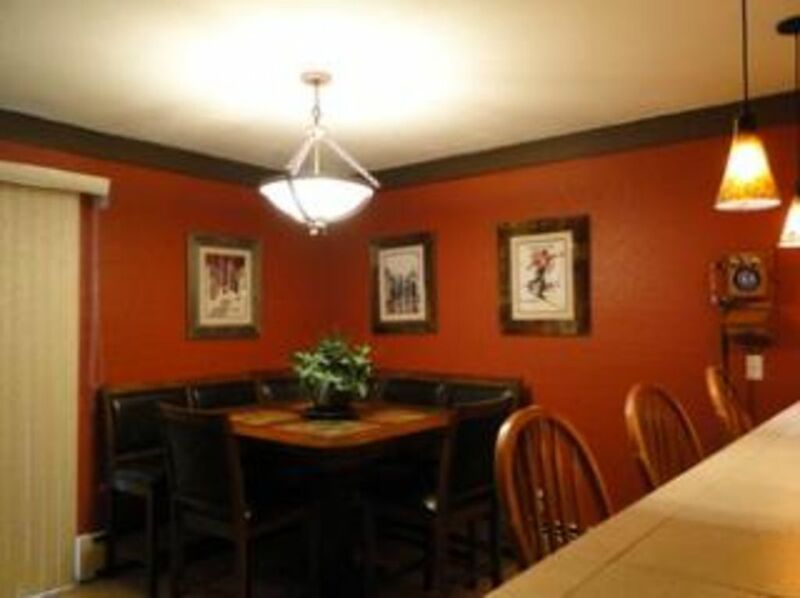 The condo is perfectly located a few blocks from Main Street so extremely convenient walk to restaurants and shops. Overall, we would not return. We had trouble getting in as one email gave a conflicting key code from another. We called to get help and the person was rude. The condo is in need of attention, a lot of deferred maintenance (cabinet door fronts missing - drawer off tracks, etc. ), dirty shower curtains, some small appliances not working, no coffee filters, dirty dishes (wine glasses especially), TV living room has a dark spot interfering with picture, missing batteries from remotes, etc. We did get snowed in Sunday and asked to extend our stay and Kena was incredibly responsive and accommodating, which is why I gave it a 3 out of 5.The place is more desirable for college kids in the shape it's currently in. One last note the person in the condo above was extremely noisy, maybe construction, but a lot of jumping around and some equipment occasionally running. The location is perfect! Everyone fit comfortably for sleeping arrangements, eating at the house and hanging out! Would stay again! Great location! Bathrooms and amenities need updating. Loved the location. The living and dining areas were large. However, many essential kitchen items were missing or very old (pots/pans/utensils) Bathrooms need updated. The master bath had disgusting mildew/mold all over ceiling above shower. The pool was not heated even though it was indoor-too cold to enjoy. Hot tub and sauna were lovely. The parking underneath was convenient, however, with a roof box on our Suburu the car would not fit in the garage. I feel this should be listed with parking. There was also only 1 parking pass available for lot parking-we had 3 vehicles. This did not work. The owner was very responsive as we had trouble getting in locked pool area-the code given was not correct. I was highly disappointed there were no extra towels. We had to reuse towels all week and use same towels for pool. Loved the location, cannot say enough about the location. We had a wonderful stay, but for the money spent I’d like 2 towels and a clean bathroom! Thank you for the review! What did you feel was missing in the kitchen? We really try and make sure it is well stocked. The pot and pans are older, but they are still in great condition. We did take care of the mildew on the shower ceiling- thank you for pointing it out. As for the pool, it is heated- it isn't kept at a high temp, but it is always around 90 degrees, which I will say feels so cool. I understand your frustration with the towels- we do stock the condo with with at least 10 sets of towel, but we don't have a daily maid service. Which is part of the reason is it cheaper to stay with us than a hotel. Re-use of the towels is a must in this case. IF we know in advance that there will be a need of more towels, I can ask our cleaning crew to leave more than 10 sets. We hope to see you again, thank you again for the review! Cozy in a great location! Had a wonderful experience staying here for 3 nights. We were very comfortable and it was in a PERFECT location! Walking distance to everything. It was a little noisy at night, we heard water running behind the thin walls but other than that it was an amazing experience and would definitely stay here again! The owners were very easy to work with and very accommodating. Thank you for everything! Thank you for the review!! I hope you stay with us again! Great place, perfect for a weekend getaway. Great location to walk anywhere in town. The condo was as advertised and we enjoyed our stay. The location could not be more convenient! I don't recall mention of the washer/dryer being in the basement of the building. We were expecting it to be in the actual condo. That was the only surprise for us. The folks staying up stairs woke up around 5:00 every morning which was not ideal for sleeping in; however, that is completely out of the control of this owner and may be random. I guess that's the chance you take with renting a condo versus an actual house.